The state Senate in Colorado has passed legislation that would give the state’s electoral votes to the winner of the national popular vote. The legislation, SB-19, aimed at ditching the Electoral College passed Colorado’s Senate on Jan. 29 by a vote of 19-16, with all Democrats voting in favor and all Republicans against. Under Democratic Sen. Mike Foote’s bill, Colorado would join 11 states and the District of Columbia in the so-called National Popular Vote Interstate Compact. The compact would require participants’ electors to cast their vote for the winner of the national popular vote. Colorado has nine electoral votes. 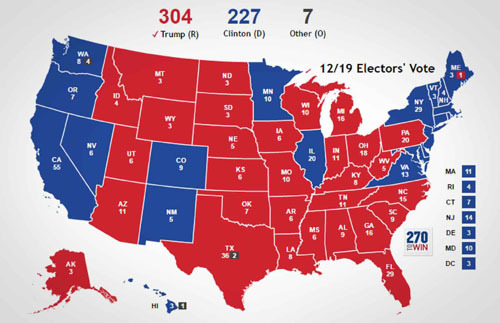 In the 2016 election, Donald Trump took home 304 electoral votes, while Hillary Clinton had 227. Clinton, who led by overwhelming majorities in urban counties of California and New York, won the popular vote by 3 million votes. Clinton in September of last year called for abolishing the Electoral College. The Colorado bill is not likely to become law unless the Colorado House approves and enough states agree to the compact. The states which have thus far agreed to the compact add up to 172 electoral votes. If 98 more electoral votes commit it would go into effect, though its constitutionality would almost certainly be challenged in court.